I've now completed my third illustration for Insight Magazine's March issue! 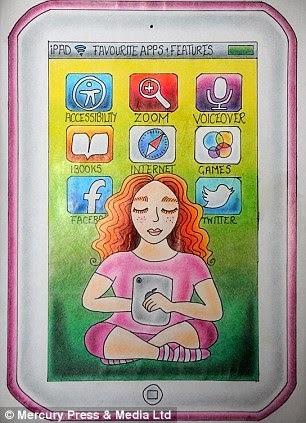 The theme is 'preparing for adult life' and my illustration was created using coloured pencils and a fine liner. It portrays me in my high school uniform when I was a teenager, looking towards the future of adult life and the tasks it includes - food shopping independently, washing clothes, preparing meals safely, managing money and paying bills. These are skills that I'm still learning as a severely visually impaired adult. I currently receive help from an enablement officer based at Henshaws Society for Blind People, who visits me regularly to help me learn kitchen skills such as using appliances, pouring hot liquids, chopping, peeling and spreading, and working up to preparing small meals for myself safely and independently. The February issue of Insight Magazine will be sent out very soon, so I will post a scan of my second illustration and my small article when it's released! 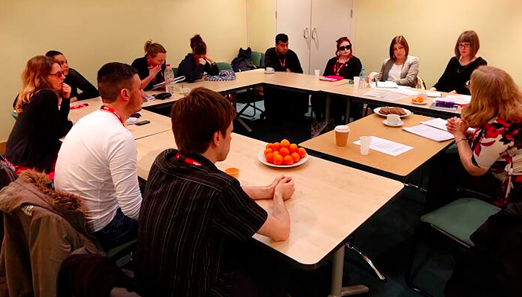 On Monday 17th February, Envision's steering group had its first meeting at the RNIB HQ in Judd Street, London. The eight members of the group travelled from various points across England, including Manchester, Wigan, Darlington, Swansea, Essex, and Birmingham, to attend the meeting and to help shape the first campaign - accessible menus in coffee shops and improved support for visually impaired and blind customers. Hugh Huddy, a member of the RNIB campaigns team, joined our discussion towards the end of the session, giving us a new perspective on how to approach a campaign. 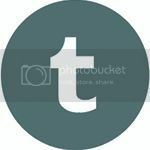 He also told us about questioning a company's audience through their slogan and quotes they use on their website, and how we can use that to our advantage. We will be having a series of teleconferences among the sub-groups at the beginning of March. More information can be found about our steering group planning day by clicking here at the official RNIB website. 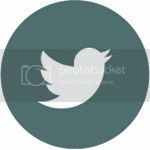 As a member of the new Communications sub-group, specialising in social media, I decided to create a Twitter account for the Envision network recently. I wanted our Twitter handle to match that of the Facebook page set up by the RNIB campaigning team, EnvisionEngland, to dispel any confusion with too many different usernames. I designed the layout in Photoshop, uploaded the first group shot of our campaigning network and tweeted some of the most important information regarding our group and first campaign, with links to the RNIB website. I will continue to tweet on behalf of the rest of Envision until the Communications teleconference on March 13th, when we can discuss sharing the account and deciding when to tweet so we don't overlap information. 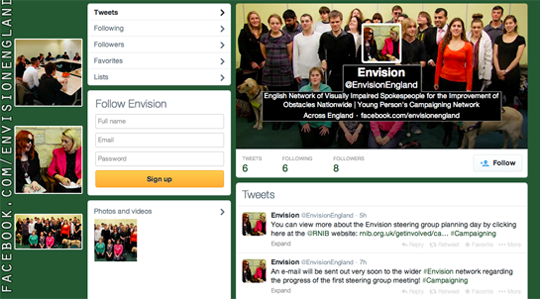 We've received support and retweets so far from the official RNIB account! I was recently contacted by ITV to do an interview for their website and appear on Granada Reports. I did the filming yesterday morning with journalist Tim Scott and it aired in the evening on ITV at 6pm. I've never been on television before, so I was extremely nervous to start with! Tim was really friendly though and quickly put my mind at ease. 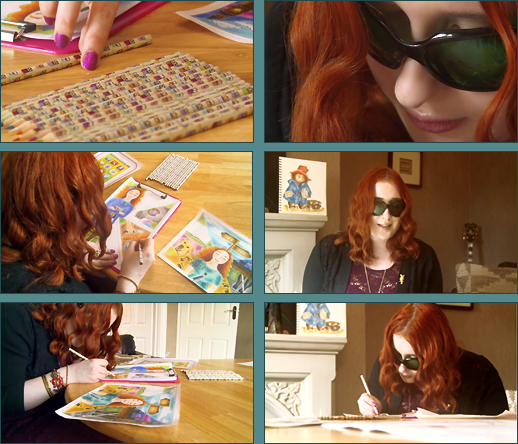 We discussed my eye condition, how I got into drawing, my illustrations for RNIB's Insight Magazine and my future plans for training for a guide dog and eventually wanting to do an art course at the Royal National College for the Blind. 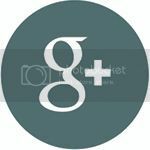 You can view the video by clicking here or on the image below. Born virtually blind, much of Kimberley Burrows' childhood was spent on the operating table at Great Ormond Street Children's Hospital in London. Now, age 25, she can only see out of 10% of one eye but that hasn't stopped her from doing what she loves. Kimberley: When I was little I just always loved drawing. When I was in the waiting rooms at Great Ormond Street they had pencils and paper, so I always did some doodling. At school, art was my favourite subject - I took it for my GCSE's and I got an A*. So it's just always something that I've loved. Tim Scott: How much harder is it for you being partially sighted and doing these lovely illustrations? Is it really difficult? How does it work? Kimberley: I can spend about 20 minutes at a time and I probably do about an hour every day. Each piece will take about a month to complete. And now Kimberley's hard work is being repaid. 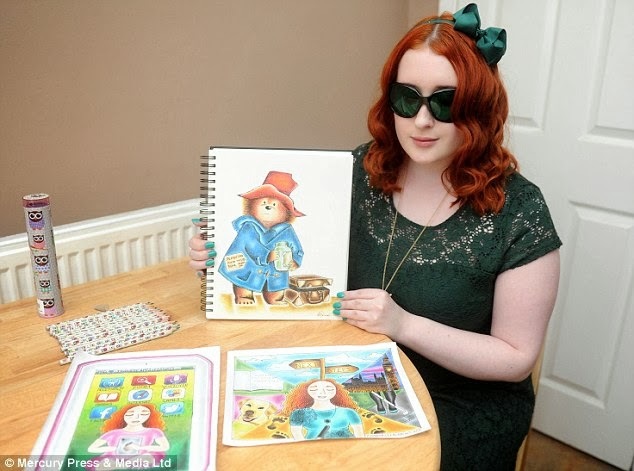 She's been named as the Royal Institute for the Blind's Young Illustrator of the Year for their Insight Magazine. Kimberley: I spent a month doing this piece (pictured) which was based on my next steps. I sent it by e-mail and it didn't take too long to get a response back and they said that I'd won. Tim Scott: How did you feel when you won the competition? Kimberley: I was just so happy I could have run around the house! I just couldn't believe that after spending a month on it, it paid off. Tim Scott: What would your advice be to somebody who's blind or partially sighted who thinks "I can't possibly do this or that"? Kimberley: You can do anything that you put your mind to. Just because you've got a disability doesn't mean you don't have the ability to do something. Any barrier can be overcome and your dreams definitely can come true! 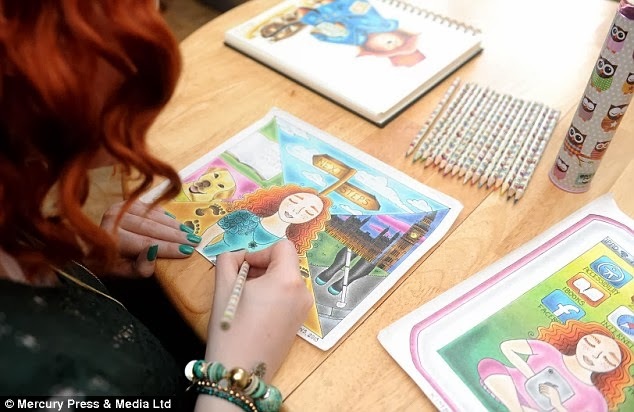 Kimberley's dream is to study art at college and become a professional illustrator. With talent like hers, she'll probably succeed. Tim Scott, ITV News, Irlam. 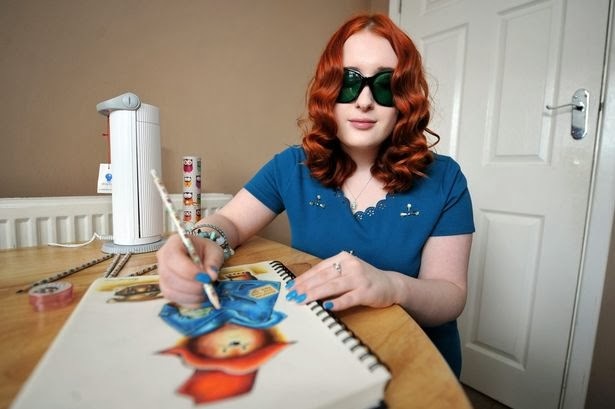 Kimberley Burrows was born partially blind and she can only see a little out of one eye, but this has not stopped her pursuing her dream of being a full-time artist. 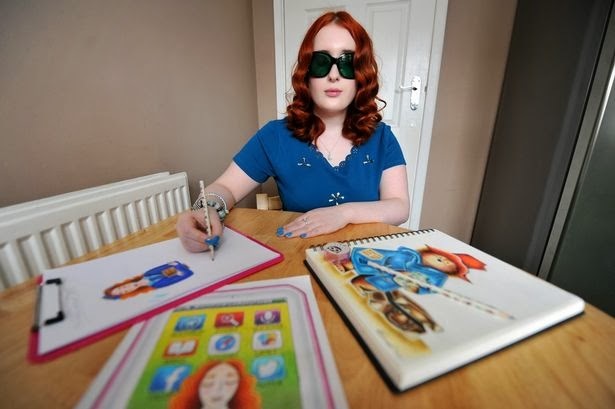 She has now come one step further to her dream after being awarded the prestigious title of 'Young Illustrator of the Year' by RNIB's insight Magazine. 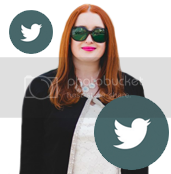 As a result, she will be producing artwork for the magazine throughout the year. Her winning illustration represented the next steps she intends to take in her life. This included training to have a guide dog, completing a braille course and a mobility course with a cane. She took a month to complete this work as her condition means she can only draw for very short periods of time. She draws using pencil crayons and fine liners, and uses a Daylight lamp to help her with her sight. or on the ITV News website here. I did an interview with the national press on Friday morning and had photographs taken the next day, which was picked up by the Daily Mail Online this afternoon. I cannot believe that such a huge newspaper wanted my story on their website! I'm really pleased with how it all turned out, just like with the Salford Advertiser / MEN article! Both articles have really reassured me, and the response has been so positive! 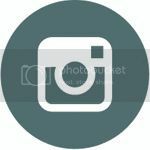 Below are the photographs that were taken over the weekend, and I have copied the article below for you to read. 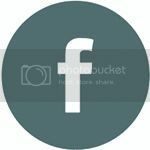 Photographs © Mercury Press & Media Ltd. These stunning pieces of art will never be seen by their creator properly, as she is unable to see in one eye. 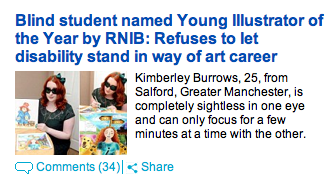 Kimberley Burrows, 25, from Salford, Greater Manchester is completely blind in one eye and can only focus for a few minutes at a time in her other. 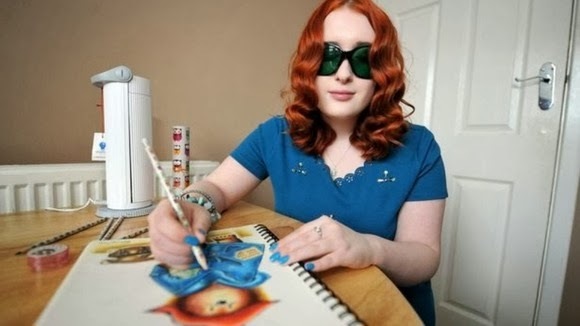 In spite of her disability she is establishing herself in the art world, with the RNIB's Insight Magazine recently naming her Young Illustrator of the Year for 2014. Kimberley dreams of one day being a children's book illustrator; her Paddington drawing, left, and another piece featuring herself, right. 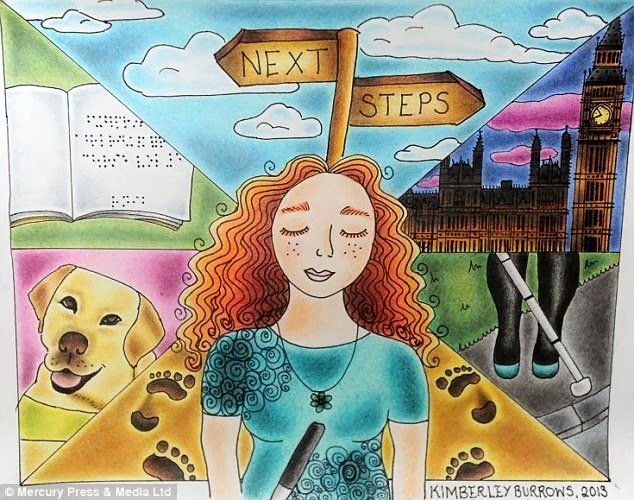 Kimberley is also studying Braille and hopes to get her own guide dog, as depicted in this drawing. Kimberley can only work on a piece for 20 minutes at a time due to the strain it places on her eyes. The article can be seen on the Daily Mail Online website by clicking on the thumbnail above. Last Thursday I had an interview with Ruhubia Akbor, a journalist who works with the Manchester Evening News, and on Monday a photographer came to my home to take some shots for the accompanying article. 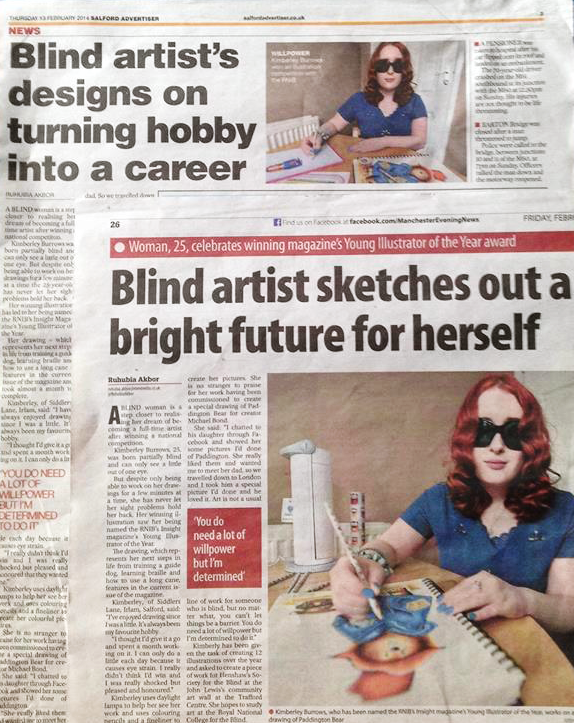 Both of my articles for the Salford Advertiser (Thursday, 13th February) and the Manchester Evening News (Friday, 14th February) can be seen below, detailing my journey of winning the RNIB's Illustrator of the Year for 2014 and producing illustrations for their Insight Magazine. A blind woman is a step closer to realising her dream of becoming an artist after winning a national competition. 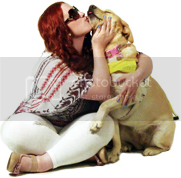 Kimberley Burrows, 25, was born partially blind and can only see a little out of one eye. But despite only being able to work on her drawings for a few minutes at a time, she has never let her sight problems hold her back. Her winning illustration saw her being named the RNIB's Insight Magazine's Illustrator of the Year. 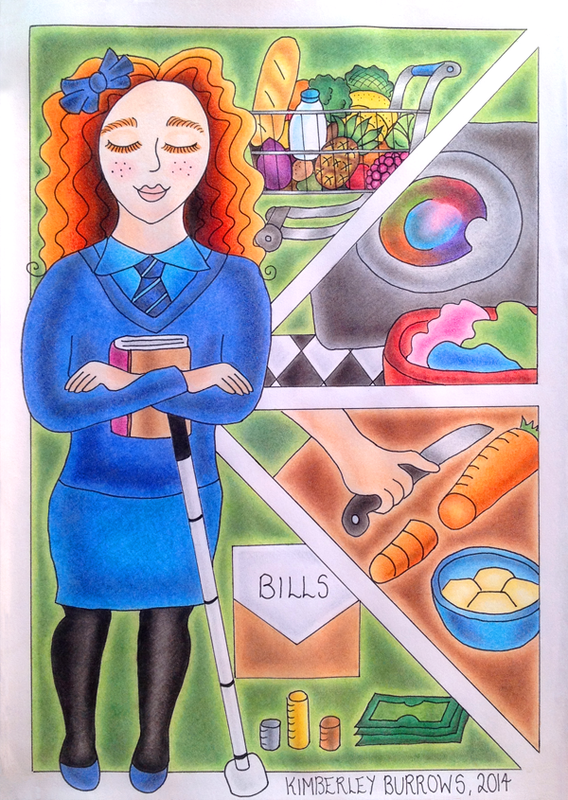 Her drawing - which represents her next steps in life from training for her guide dog, learning braille and how to use a long cane - features in the current issue of the magazine and took almost a month to complete. Kimberley, of Irlam in Salford, said: "I've enjoyed drawing since I was a little girl. It has always been my favourite hobby. I thought I'd give it a go and spent a month working on it. I can only do a little each day as it causes eye strain. I really didn't think I'd win and I was really shocked, but pleased and honoured." Kimberley uses a Daylight lamp to help her see her work and uses colouring pencils and a fineliner to create her colourful pictures. 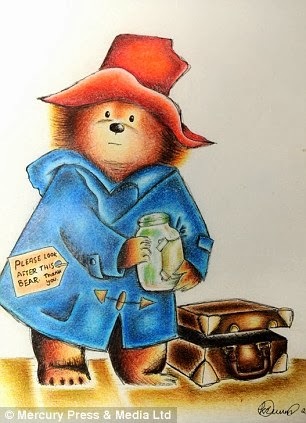 She is no stranger to praise for her work having been commissioned to create a special drawing of Paddington Bear for creator Michael Bond. She said, "I chatted to his daughter through Facebook and showed her some pictures I'd done of Paddington. She really liked them and wanted me to meet her dad, so we travelled down to London and I took him a special picture I'd done and he loved it. Art is not a usual line of work for someone who is blind, but no matter what, you can't let things be a barrier. You have to overcome and achieve what you want to achieve. You do need a lot of willpower but I'm determined to do it." Kimberley has now been given the task of creating 12 illustrations over the year and asked to create a piece of artwork for Henshaws Society the Blind at John Lewis' community art wall in the Trafford Centre. She has ambitions to study art at the Royal National College for the Blind after she has a fully trained guide dog. The article can also be viewed on the Manchester Evening News official website here. It was wonderful to go to Henshaws yesterday, at Artherton House in Manchester, and share the experience with my friends and the staff - with some of them already having seen my article in the Salford Advertiser the night before. It was also very surreal to listen to the Salford Talking News and hear the team reading out the article, describing my photographs (with some really love compliments!) and give very positive comments. They also recognised that I'm a listener of the local talking news and wished me the best of luck for the future. I'm extremely honoured that Ruhubia wanted to write an article about me and am so thankful for the opportunities it has presented - an interview with the national press and ITV news, coming very soon! 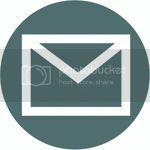 I've been quite busy recently, so haven't had much time to blog about the things I've been up to. I thought I would share some upcoming events so you can have a look at what I'll be getting up to in the coming weeks! Salford News will have a photographer come to my home and take pictures of myself with some of my illustrations. I was contacted by a journalist recently on Twitter, who works for the Salford Advertiser - my local newspaper - who kindly wanted to interview me regarding my illustrations for RNIB's Insight Magazine. I did the interview on Friday and will have the photos to accompany the article taken on Monday. Interviews with both the National Press and Quays News, regarding my illustrations for the RNIB's Insight Magazine and winning the Illustrator of the Year 2014 competition! The interview with Quays News will describe my sight loss journey and how Henshaws have helped me to gain confidence, new skills and a social life. A visit from a photographer from the National Press, to take various photographs to go alongside my interview from Friday. Will be featured in various newspapers and magazines. I'll be visiting the RNIB's headquarters in Judd Street, as a follow up to my October visit, now part of the steering group within the campaigning network we recently set up. We'll be discussing our first campaign - accessible menus in coffee shops - and where we want to take it. ITV will be coming to my home to film an interview with me for Granada Reports, discussing my illustrations for RNIB's Insight magazine and how I got into drawing. Set to air in the evening on ITV at 6pm. I'll be having photos taken at Henshaws to be used on the blog and in the Vision newsletter alongside my Day in the Life article that I recently wrote. I was invited by Henshaws to take part in a media training session at the Oasis Academy in MediaCity UK. I'll be learning new skills such as radio and TV presenting and interviewing. Meeting with the Police and Crime Commissioner's office in Swinton with the engagement team, to discuss the issue of hate-crime against visually impaired and blind people and what I can do to help with a campaign. An hour long teleconference with the communications sub-group of the Envision network. We'll discuss what roles to manage within the group as well as address any queries regarding our new role. 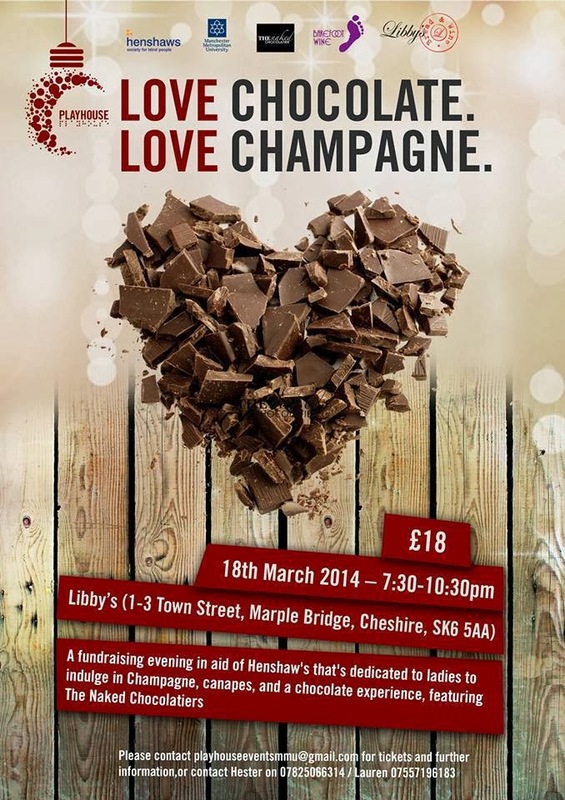 Henshaws have kindly invited me to attend a Champagne and Chocolate evening, organised by students at Manchester University, at Libby's in Cheshire. The Henshaws short film will be shown beforehand and then I will be giving a speech about my sight loss journey and how Henshaws have helped to vastly improve my quality of life through their support with daily living skills, their spectrum of groups and friendly social environment. There will be champagne, canapes and a chocolate experience featuring The Naked Chocolatiers. I'll be attending the Henshaws Fashion Fundraiser, giving a speech about my time using the Henshaws service and how it has greatly changed my life in all possible areas. 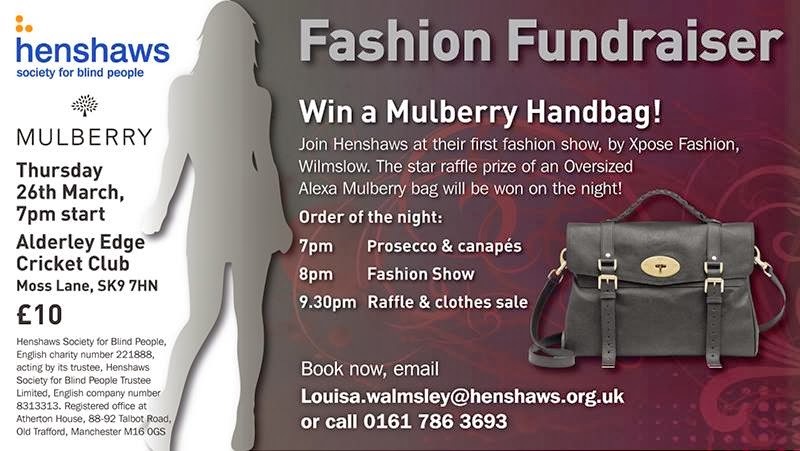 I'll also be drawing the raffle ticket out at the end of the event, to award the prize of a Mulberry handbag to the winning raffle ticket holder! This afternoon I was kindly sent a tweet by a journalist from Salford News, Ruhubia Akbor, who wanted to interview me regarding my illustrations for RNIB's Insight Magazine. @Glittered Thanks for calling me back! Should make a really cute story! photographer will be with you on Monday. have a great weekend too! We had a phone interview, discussing how I began drawing and the aids I use to help make it easier for me. I explained that I've been drawing ever since I was little, and use aids such as a folding bed table and Daylight lamp to help improve the lighting and bring the drawing as close to me as possible. I'm not able to do much in one day, around 30 minutes or so, as I begin to get eye strain in my remaining useful vision in one eye. I also revealed that I've recently been contacted by Henshaws Society for Blind People, to submit a piece of artwork for John Lewis' Community Wall in the Trafford Centre to help celebrate John Lewis' 150th birthday this year. A photographer will be sent to my home on Monday, to take shots of me with my illustrations to go along with the article. I'm very excited and grateful indeed, this is an entirely new experience for me! I'll be sure to post them here! I never shop alone, so was with my mum at the Lowry Outlet - but had her stray behind me in the coffee shop to make it look as though I was on my own and would therefore need full assistance from the staff, rather than relying on my mum to read the menu out for me as she usually would do. They weren't easy to identify, I have to admit, but they were very helpful to me. I asked for an accessible menu and was provided with both a large print and Braille menu. It was of good quality, and enabled me to choose the drink that I wanted. I'm not entirely sure if included everything on the main menu, but it did seem to include the main staple drinks such as a hot chocolate, americano, espresso, etc. and I believe the large print included some holiday flavours such as caramel and toffee nut lattes. Yes, I was able to read the menu on my own for the first time in its entirety and it was quite exciting for me to have access to that information. Usually my mum or dad will read parts of the menu out to me, reading out drinks they know that I like, none of us knowing that there were accessible menus available as they've never been offered to me before at Costa. Yes, the member of staff who served me offered an arm to guide me to a table, helped me identify the chair, and then handed me the large print and Braille menus. I was given time to read the Braille menu and find what I wanted to order (the large print was too small for me) and then came back to ask if everything was okay with the information and asked what I would like to order. When I picked a coffee, she let me know of any additional toppings that I could have and brought it over for me, which was extremely kind as It saved me from queueing up and struggling to balance holding my tray and using a cane at the same time. I was also offered additional help from a customer who was sat nearby, and she told me that that her brother has sight loss too. I really enjoyed my experience (and my drink!) and was pleasantly surprised by the staff and how aware they were and how trained they seemed to be. I didn't go in with any expectations, but have to say that I was really pleased with their support and service. I also enjoyed talking with the elderly customer who also helped me and it was lovely that she wanted to introduce herself and talk to me and find out more about my visual impairment. I left a tip for the staff in the large tip mug that they have, after asking if they accepted them and they helped to identify the tip mug for me. Absolutely! 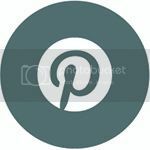 I occasionally visit Costa Coffee already as they are connected to a lot of ODEON cinemas and I go to the cinema a few times a year with my dad, or when I'm out shopping with my mum. Now that I know that they have accessible menus available, especially Braille, and that the staff are well trained and aware of blind and visually impaired customers, I will definitely visit again in the near future. Due to the background noise in coffee shops, it can be very hard to hear what the staff are saying at times. 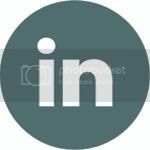 I think hearing loops installed into the main coffee chains would be extremely beneficial to those who are hard of hearing with hearing aids, as they are with other places such as banks and supermarket help desks. It would help if the staff could identify themselves better as I had no idea where they were when I was first walking into the coffee shop. I think it would also be nice to be offered an accessible menu rather than having to ask for one, I had no idea that Costa even had Braille menus because they'd never been offered to me before even though my UV glasses and long cane are big clues that I'm severely visually impaired. I never shop alone, so was with my mum at the Trafford Centre - but had her stray behind me in the coffee shop to make it look as though I was on my own and would therefore need full assistance from the staff, rather than relying on my mum to read the menu out for me as she usually would do. They weren't easy to identify and the counter wasn't very easy to identify either as the shop was so crowded (my mum had to lead me to the counter). It was quite hard to hear where the staff were due to the background noise. No, they didn't have a braille or large print menu available. They apologised for that. A member of staff didn't read out the menu, but asked what I would like to have instead. I picked hot chocolate, and he went through the different sizes and syrups and recommended his favourite. He also let me hold some cups to help me to decide what size I would like to have. I said what sort of drink I would like to have, and then variations were explained such as having additional whipped cream and a variety of syrups included in the drink. The member of staff's favourite was highly recommended so I went with that option - hot chocolate with caramel syrup. The member of staff offered to help lead me to a table, but he only walked next to me rather than having me take his elbow so I was able to be lead to where I was supposed to go. My cane found the table and chairs, rather than them being pointed out to me. Also, while in the queue, there was a basket of some sort coming up towards me when I was making my way to collect my coffee. It was only until a gentleman in the queue pointed it out that I knew it was there, the staff didn't point it out to me. 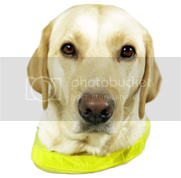 Those baskets of goods could be quite an obstacle for other visually impaired customers and throw them off a little bit. I enjoyed my drink, and I liked that I was given the different sized cups to have a feel of what size drink I would like, but I feel like everything else was lacking - especially in comparison to Costa Coffee that I visited earlier in the month. I felt like I was left by the wayside a little bit, and wasn't checked on to see if there was anything i would have liked or whether I was enjoying my drink. Costa Coffee was definitely a much better experience for me. After visiting Costa Coffee first, and experiencing how accessible it is in there with a braille menu and great support and service from the staff, I don't think that Starbucks will be somewhere that I'll return to in the future. At least, not until they make some changes like training the staff to support a blind or visually impaired customer better and providing accessible menus. I don't feel that I had the same level of service as everybody else. Due to the background noise in coffee shops, it can be very hard to hear what the staff are saying at times. I think hearing loops installed into the main coffee chains would be extremely beneficial to those who are hard of hearing with hearing aids, as they are with other places such as banks and supermarket help desks. It would help if the staff could identify themselves better as I had no idea where they were when I was first walking into the coffee shop. Perhaps tactile markings on the floor would be a great idea to help identify where the counter will be with a cane, as with curbs outside. Starbucks also need to move the baskets of goods that seem to be in the middle of the queue out of the way to prevent any accidents. They weren't easy to identify and the counter wasn't very easy to identify either (my mum told me which side of the room the counter was on) but they talked much louder in Cafe Nero than in Starbucks so that was much more helpful. After making herself known to me, the member of staff came round the counter so it was much easier to communicate with her. She was the only member of staff from either 3 of the coffee shops that I visited that did this, and I really liked it and found it effective to have her next to me rather than talking to her over a counter. She led me to a seat and went through the options for the drink I wanted to have. No, Cafe Nero didn't have a braille or large print menu available. A member of staff didn't read out the menu, but asked what I would like to have instead after she guided me to a table. I picked hot chocolate, and she went through the two different sizes (regular and large) and the different toppings that were available (whipped cream and chocolate sprinkles). I said what sort of drink I would like to have, and then variations were explained to me such as having additional whipped cream and chocolate sprinkles. I chose all of the toppings! Yes, much better knowledge of support than in Starbucks. The member of staff correctly guided me to a table by having me take her elbow, rather than walking to me and having me try to find a table and chair with my cane. She identified and pulled out the chair for me and helped me with my money. I really enjoyed my drink, and the support and service was quite good. The member of staff that helped to support me was really lovely and made all the difference for an enjoyable experience. The price of the drink was a little cheaper than Starbucks, and I got more hot chocolate for my money. Starbucks was very expensive for such a small drink. Despite not having an accessible menu, I think I would visit Cafe Nero again - though it wouldn't be in the immediate future, as I would rather pick Costa Coffee after this experiment. It was pleasant though, and the hot chocolate drink was nice too! Due to the background noise in coffee shops, it can be very hard to hear what the staff are saying at times. I think hearing loops installed into the main coffee chains would be extremely beneficial to those who are hard of hearing with hearing aids, as they are with other places such as banks and supermarket help desks. It would help if the staff could identify themselves better as I had no idea where they were when I was first walking into the coffee shop. Perhaps tactile markings on the floor would be a great idea to help identify where the counter will be with a cane, as with curbs outside. Costa Coffee was definitely the best place to visit, in my opinion, having both braille and large print menus available and such wonderful support and service for a visually impaired customer. They were friendly, approachable and well trained in how to guide someone correctly. The support in Cafe Nero was good too, and made up for not having an accessible menu - though having a braille or large print menu would have given a better score. Starbucks was the least enjoyable for me, the drink was very expensive for what I got (a kids' sized hot chocolate) and the support was lacking. Starbucks definitely needs to be improved, especially as it's such a large chain and seems to be the most popular coffee shop our of the 4.